Have I mentioned that I love Christmas? This time of year really is my favorite. Not only is it the best birthday ever (Christ’s, of course), but I get to see most of my family in one place for a few days of cooking, laughing and eating. There will be 16 of us under one roof this year, eight of those being children which translates into lots of late-night giggles, shrieks of delight and probably the occasional tantrum. But there is one problem with such festive plans: the planning. I have a backup of photos waiting to be shared and recipes to be tasted, but making a large family gathering fun requires planning. So I am off to make the Brunswick Stew (Dad’s southern request) and the sticky buns (photos to come). Have a Merry and Blessed Christmas spending time with the ones you love. 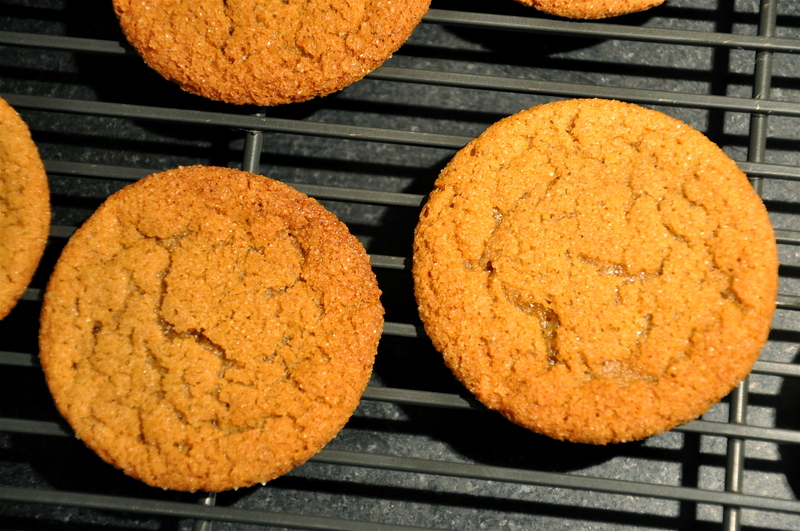 And if you get snowed in (we can only hope), here’s our favorite cookie recipe to sustain you. Note: This is a fabulous recipe for little hands! My children love to shape the dough then roll the balls in sugar for baking. Make sure to CHILL the dough. I make the recipe in the morning then chill and bake in the afternoon. Melt butter; let cool in a large mixing bowl. When butter is cool, add 1 cup of sugar, the molasses and the egg. Beat well. Sift together dry ingredients and add to the wet mixture. Mix well. Chill dough at least an hour. 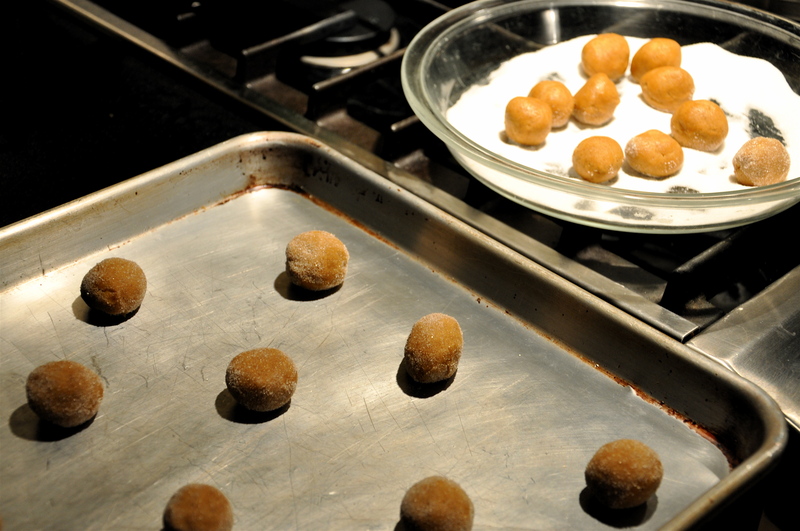 Roll dough into 1-inch balls and roll in remaining sugar. Place on prepared cookie sheets. Bake 8–10 minutes. The cookies should be crisp on the edges but still soft in the middle. 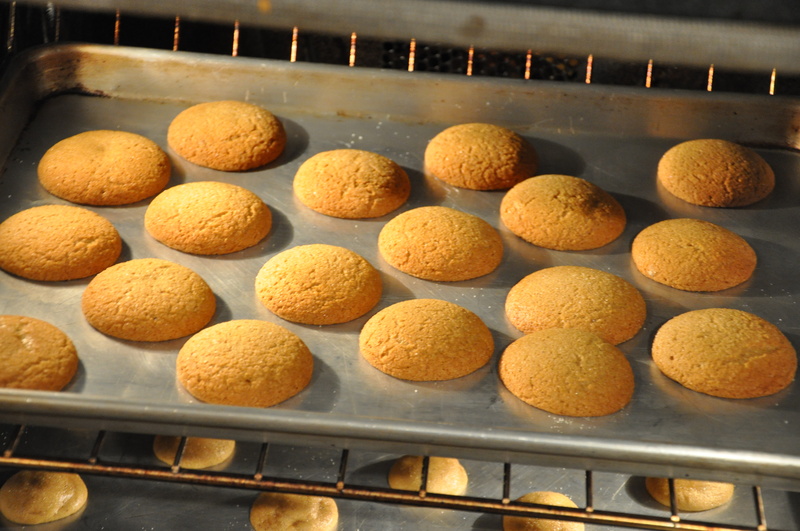 Let cool 1–2 minutes before removing to cooling rack. Gourmet is gone. I’m not currently a subscriber. I was a proud regular until I had children, and then I just didn’t have the time or the inclination to track down ingredients at my local Korean market (I live in the CT burbs) or read about some insanely remote and expensive journey. But it is sad nonetheless. Especially when I remember my mother poring over her monthly issue, with me tasting its fruits. I am sure I have some issues (magazines, that is) in the basement somewhere, but fortunately for everyone the recipes are immortalized on epicurious. Here are some links provided by fellow foodies with varied points of view on Gourmet‘s demise.